joined North Carolina State University in August 2014 as a Chancellor’s Faculty Excellence Program cluster hire in Data-Driven Science. He is a receipt of the DOE Early Career Award, NSF CAREER Award, Google Faculty Research Award, and IBM CAS Faculty Fellow Award. He is an ACM Distinguished Member, ACM Distinguished Speaker, and a senior member of IEEE. He was honored with University Faculty Scholars Award "as an emerging academic leader who turns research into solutions to society’s most pressing issues". lies in the broad fields of Programming Systems and Machine Learning, with an emphasis on enabling extreme-scale data-intensive computing and intelligent computing through innovations in compilers,runtime systems, and Machine Learning algorithms. 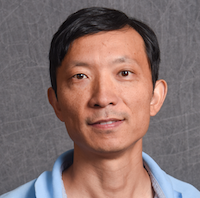 His current research focuses on Heterogeneous Massively Parallel Computing, High Performance Machine Learning, and High-Level Large-Scale Program Optimizations. He leads the PICTure research group. He is part of the NCSU Systems Laboratory. We propose the first known solution to enable direct document analytics on compressed data, which save 90.8% storage space and 77.5% memory usage, while halving the analytics time. It employs a hierarchical compression algorithm to convert analytics problems into graph traversal problems. The article presents a set of guidelines and assistant software modules for developers to effectively apply compression-based direct processing. See our VLDB'18 and ICS'18 papers for more. ICCD'18, DOE'17, NSF'16, NSF'15, NSF'14, DOE'14, DOE'11, NSF'11, IISWC'10, NSF'09, NSF'08. “Do Computer Programs Have to Be As Dumb As They Are?”, International workshop on Code OptimiSation for MultI and many Cores, Co-located with CGO, 2013. “Data Locality for Massive Parallelism”, International Workshop on Programming Models and Applications for Multicores and Manycores, Co-located with PPOPP, 2013. “Data Locality for Massive Parallelism”, ACM SIGPLAN Workshop on Memory Systems Performance and Correctness (MSPC), 2013. “Exerting the Hidden Power of Compilers for Modern Computing”, The 30th International Workshop on Languages and Compilers for Parallel Computing, 2017. “Can Compilers Generate Better Learning Algorithms than Experts Do?”, WASEA workshop associated with PACT, September, 2016. “Do Computer Programs Have to Be As Dumb As They Are?”, Virtual Machines and Intermediate Languages, Co-located with OOPSLA, Indianapolis, Indiana, 2013. “Input-Centric Program Optimizations”, International workshop on Code OptimiSation for MultI and many Cores, Co-located with CGO, 2013. "The highest goodness is like water. Water benefits all things and does not compete. It stays in the lowly places which others despise. Therefore it is near The Eternal." --- Laozi.